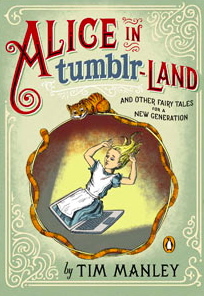 Alice in tumblr-Land and Other Fairy Tales for a New Generation by Tim Manly. Published by Penguin Books (29 Oct 2013). Based on the blog Fairy Tales for Twenty-Somethings. The Ugly Duckling still feels gross compared to everyone else, but now she’s got Instagram, and there’s this one filter that makes her look awesome. Cinderella swaps her glass slippers for Crocs. The Tortoise and the Hare Facebook stalk each other. Goldilocks goes gluten free. And Peter Pan finally has to grow up and get a job, or at least start paying rent.